Mother’s Day really snuck up on me this year. I was thinking I still had plenty of time but I only had one day!! 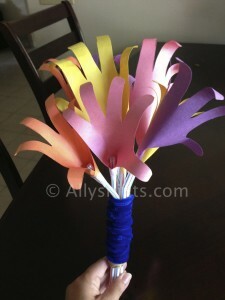 So I went on pinterest and found this great idea for a bouquet of flowers made from handprints of my little guys. I was excited because I had all the supplies so this was a completely free project and easy too! Supplies you need: colorful paper, straws or pipe cleaners, tape, scissors, ribbon or something to hold them together or something to put them in when done. 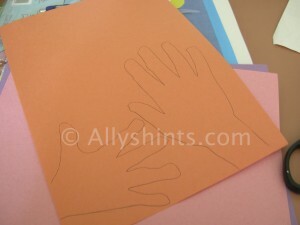 First take your child’s hand and trace it on a piece of paper. Instead of doing it over and over again I cut this one out and then traced it however many times I needed it. After tracing cut out all the hands. This is the most time consuming part of the entire project. If you are in a huge rush this may not work unless you can cut fast. Once they are all cut then curve them around the top of a straw or pipe cleaner and tape it on. Once the flower is taped on take a pen or pencil and round over the fingers to curve them. This will make them look like a lily and more like a flower. 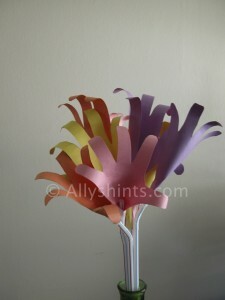 You can add decoration to them or put them in tissue paper or wrap them with ribbon or put them in a vase of their own. We gave ours to grammy tonight at dinner for Mother’s Day and she loved them. She knew right away that they were handprints of the boys. Wrapping Paper The Fun Way!